This Provincetown accommodation is nestled on 7 acres of land and features free Wi-Fi in every room. The Cape Cod National Seashore Beach is 3 miles away. 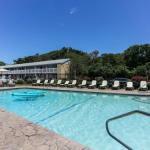 Every room at Cape Colony Inn features a refrigerator flat-screen TV work desk and Keurig coffee machine. The en suite bathrooms offer complimentary Spa 360 Body Care toiletries. Guests can avail of the on-site beach volleyball court shuffleboard courts outdoor heated pool use the on-site barbecue facilities gas grills and fire pit. A daily complimentary continental breakfast is served in the lobby. Fanizzi's Restaurant by the Sea is 5 minutesâ?? walk from the Provincetown Cape Colony. The Mews Restaurant & Cafe is half a mile away. Pilgrim Monument is 1 mile from the hotel. Art's Dune Tours are 15 minutesâ?? walk away.